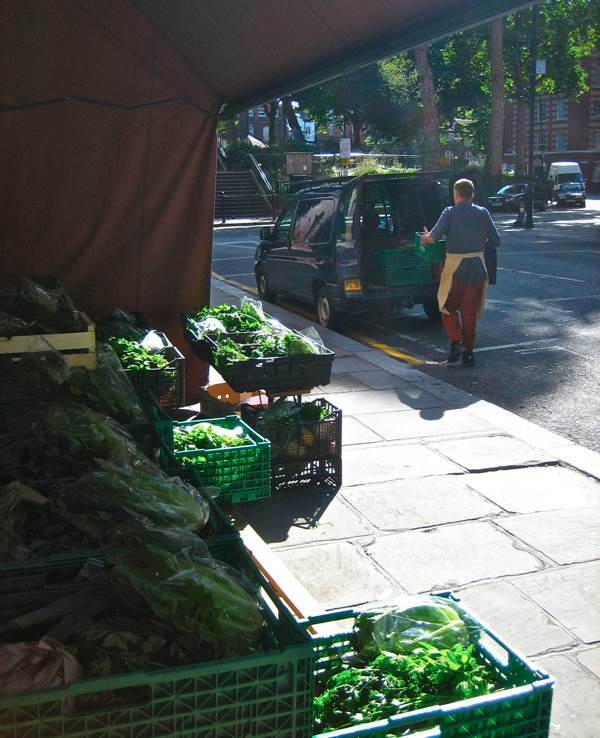 Each Monday night throughout the year, Leila McAlister goes to Covent Garden Market to buy vegetables and drives back in the early hours with the pick of the season. 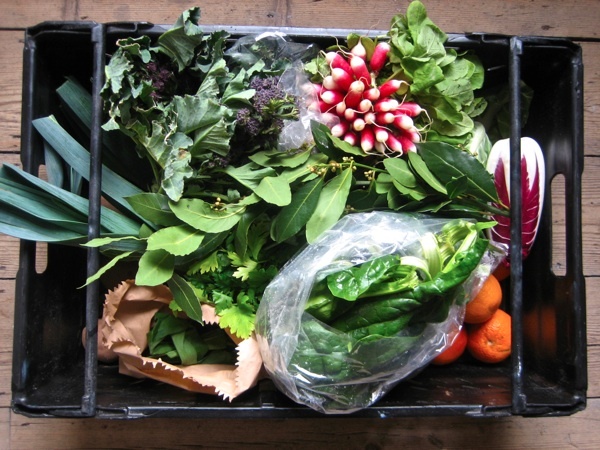 Each Tuesday morning, Norman Hyams arrives at seven thirty to make up the weekly delivery boxes from Leila’s purchases and thereby supply some of the freshest fruit and vegetables in the East End. 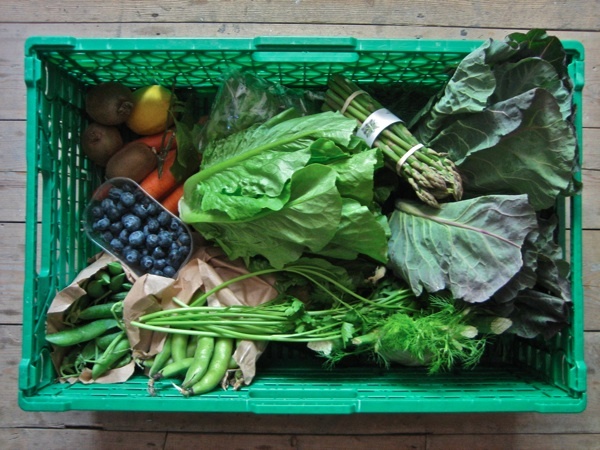 With the assistance of Lindsay Sekulowicz, who organises the displays in the shop, he lays out the green plastic crates under the brown awning in Calvert Avenue and together they distribute the produce between the boxes and, by eleven o’clock, he is on the road making his deliveries. 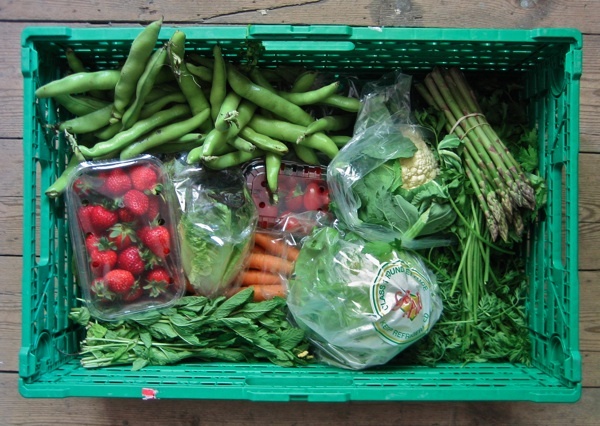 If you are lucky enough to receive one of these, then it turns Tuesday morning into one of the highlights of the week, and the contents of the box becomes a regular indicator of the changing seasons as different fruit and vegetables appear in each new crate. 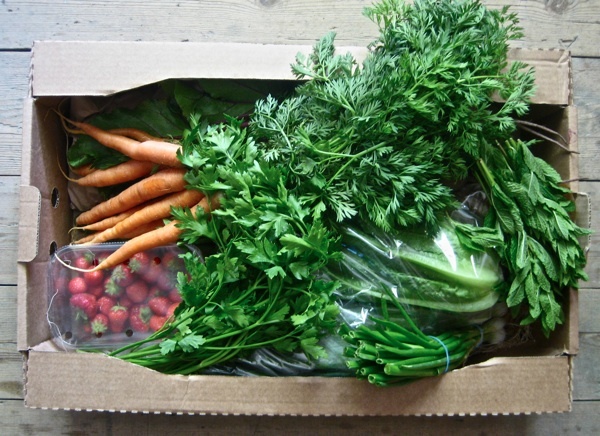 It never fails to excite me, as I search through the contents when it arrives, popping the bunches of parsley and mint in water, and assessing the possibilities for the days ahead. 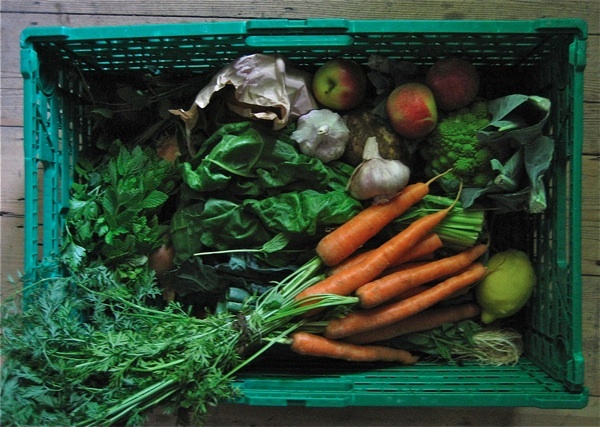 As a point of honour, I always eat all the vegetables within the week, which increases my consumption of greens, and makes shopping for meals easy, because I simply buy meat or fish to accompany what is in the box. 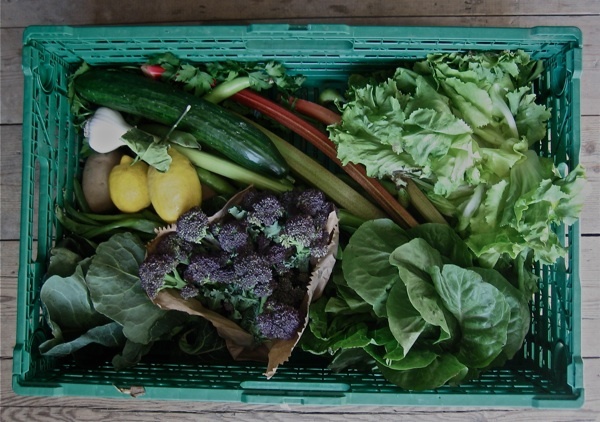 In fact, such is the beauty of these lush colourful boxes of vegetables, and such is my fascination with the progress of the year, that I photograph the box each week to create an informal vegetable calendar – you can see the last few months below. I thought I had the cushy job, ticking off the names on a clipboard for Norman while he carried the boxes in to the make the deliveries, but then I realised that on each call he was welcomed so eagerly by the recipients, and I became so intrigued by the different worlds he entered, that I leapt out of the van and accompanied him inside. Curious eyes peered hungrily over laptops at the Abake studio where the designers sat round a table working at their computers as if at a meal, and once we left our vegetable box – we presume – they swapped their devices for the serious business of lunch. Equally, at the Boudicca fashion label, where furious preparations for London Fashion Week were underway, the same roving eyes followed the box as we carried it in and put it down. 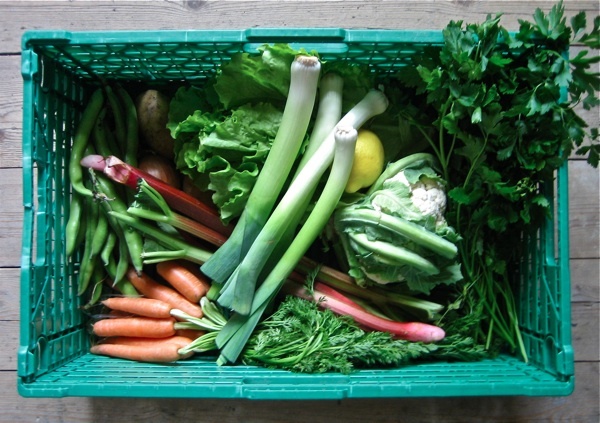 Norman delights in all the fleeting conversations in these worlds where he is the vegetable envoy. “I used to work a couple of days a week for my brother in hospitality and it was doing my head in,” he confessed to me with a frown as we walked back to the van, “So I thought it would nice to work for Leila and I texted her asking her if she needed anyone to do washing up, but there was nothing doing – instead she offered me the vegetable round.” And he gave me a smile of triumph, which indicated that he couldn’t believe his luck. By now we were almost done, yet I had become at home with the constant fragrance of fresh parsley as we drove around the East End. 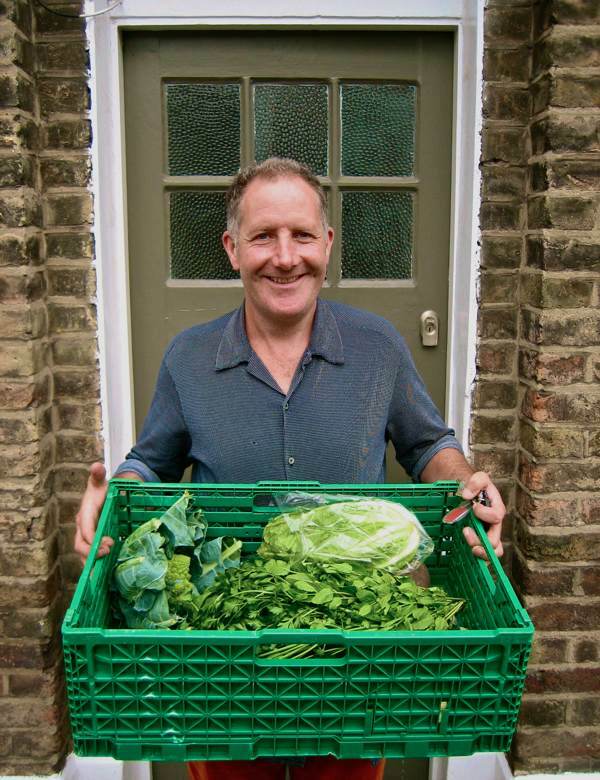 “When you get basil in the delivery boxes, the whole van smells of basil,” Norman said, with a broad smile, breathing in with a sigh of pleasure, half-lowering his eyelids in illustration of the intensity of his delight. vegetable envoy! 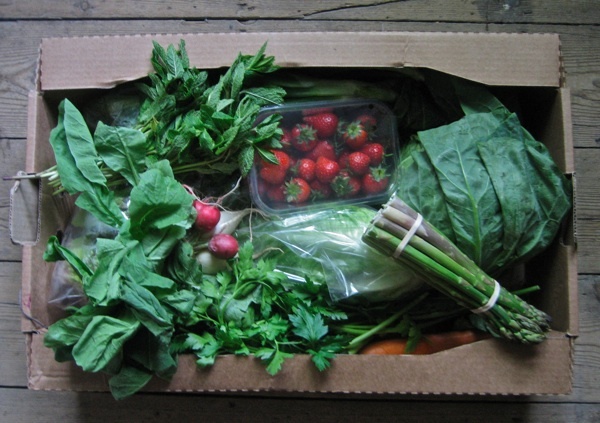 thank you for the beautiful pictures of the boxes. you’ve inspired me to sign up for one here in dusty albuquerque. i’m inspired to cook veg — just lent my new (second hand) copy of the wonderful chef, deborah madison’s, veg cooking for everyone to a friend who must diet until her baby is born. 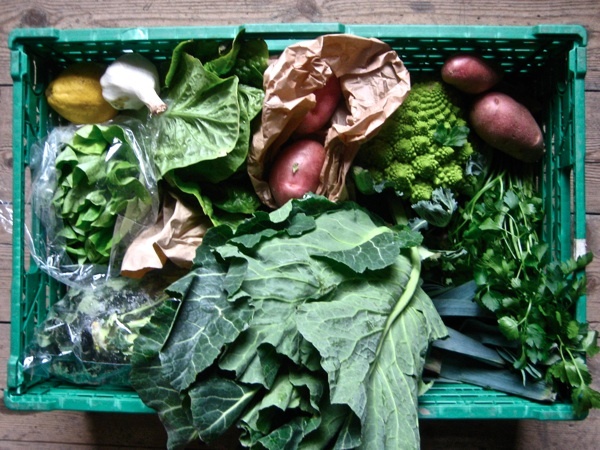 I love the surprises each week in a good veggie box: it makes cooking the daily round an exciting challenge, and it’s wonderful to have such fresh produce. Good luck, Leila and Norman! Just magnificent! What bounty! What art! I live in Israel and eagerly read Spitalfields Life. My mum used to be a meals-on-wheels lady for Hackney Borough Council. She and her driver, Kevin, delivered around De Beauvoir Town in the late 1960s. For many pensioners the meals were their only contact with the outside world. Mum spent most of her salary on tooth paste and soap for her ‘old people’. I wonder if this service still exists? Mum died very suddenly in 1969. I have a number of condolence letters from people she used to deliver the meals to. To this day, they are a great comfort. Gosh this has made me very hungry. 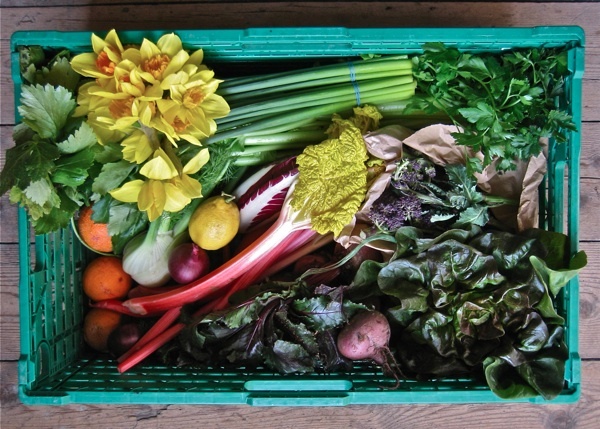 The fruit and veg aisles at Morrisons just don’t look this good. Unfortunately with adolescent boys in the house I fear we’d need more than one box! The courgette cake cooking right now probably won’t survive the evening. Melvyn, funnily enough there is a current surge of interest in what is happening to the Meals on Wheels service in this country. Eight years ago the service delivered 34 million meals a year but now they only deliver a third of this number. There is a call out at the moment for people to volunteer to get involved in providing the service. Sounds like what is needed is lots more people like your obviously much missed mum. Each one so beautiful, so carefully arranged and with such vibrant colours – you are doing the right thing in keeping a photographic record. Am envious – sigh! 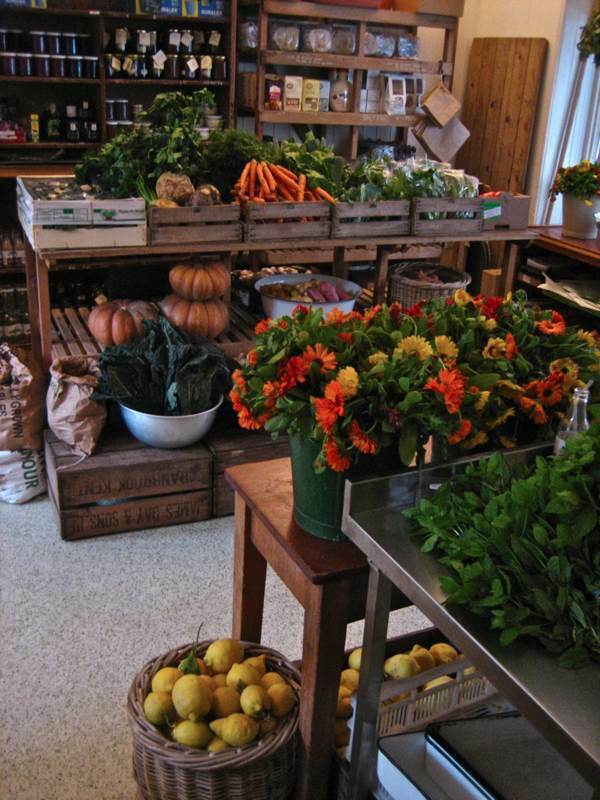 Could you drop hints to Norman about helping set up something equally beautiful in Ladbroke Grove?? This should serve as the template for anyone thinking of starting up a box-scheme. Leila’s ravishing offerings shame the box-scheme I once signed up to online that proved to be so disappointing the first week that I de-registered immediately. 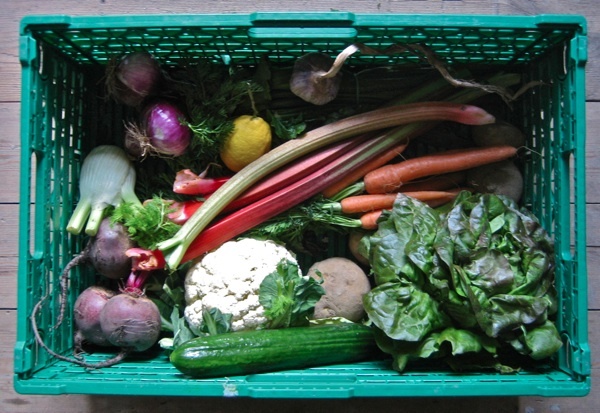 Our local box-scheme in the Ystwyth Valley on the West Wales coast, went belly-upward a few weeks ago due to the woman who organised it feeling that she couldn’t keep up a regular and diverse supply from her own-grown. (We certainly ate an awful lot of carrots from her latter boxes!) I’m looking for an alternative right now, though I fear that I shall not find anything that will come even close to Leila’s works of art!